Dinosaur Corporation: The Dinosaur Lunch Box That Speaks Volumes! Kids have been enjoying lunch boxes with various fun themes since the metal lunch box was designed in the 1950's when the Hopalong Cassidy Lunch box was introduced. By the 1970's, there were more designs to choose from, such as Raggedy Ann and Andy or Fat Albert. Kids who were blessed to have the tasty home made lunches to bring to school soon learned that, when walking in a group to and from school, it would be best to not get too close behind other kids or you might "accidentally" get whacked with someone's lunch box! The hard metal lunch boxes soon gave way to the plastic lunch boxes, also with the neat designs that kids of all ages enjoyed and now, we have the soft, insulated lunch boxes to choose from. For the dinosaur loving kid (or adult for that matter), there now exists the insulated, soft sided, full suede finish (for easy clean up) dinosaur lunch box displaying either the Tyrannosaurus Rex (T-rex) or the Velociraptor design. These dinosaur lunch boxes have a realistic rendition of the T-Rex and Velociraptor and are made by DinoGear, which is embroidered on the front of the lunchbox. 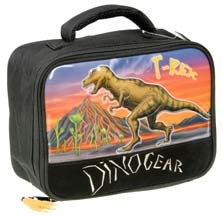 A neat feature kids will also enjoy, of either dinosaur lunch box, is the realistic dinosaur foot used as a zip-pull. Gone are the hard plastic handles of yesterday, now replaced by a comfortable, yet sturdy carry handle. There is plenty of room to pack a nutritious lunch in these durable dinosaur lunch boxes too, enough to satisfy any little dinosaur loving kid. Not to mention, the fierce realistic dinosaur pictures displayed on the front should be a warning to anyone who has thoughts of sneaking food out of this lunch box owner's lunch box. Anyone who loves fierce dinosaurs is going to be a force to be reckoned with, for sure! Even a pint sized little kid is going to be a ferocious foe, and that goes for the girls who love dinosaurs, too! The lunch boxes of yesterday, though not yet fossilized, are now considered "vintage" and anyone who owned one would have a hard time convincing their kids or grand kids that they didn't actually have to battle with the dinosaurs on their way to and from school. Although the hard metal may have caused some damage whacking it on a dinosaur's toe, any dinosaur would not have had any trouble obtaining the scrumptious contents within, nor the owner, for that matter (should they have actually co-existed). Despite the fun stories that could be told, the dinosaur lunch boxes of today can instill even greater creativity with the tales that can be passed down to future generations, with interesting dinosaur facts thrown in just to make it all the more exciting and educational! What will be missed, however, is the "Ouch" factor of getting accidentally smacked with one of these lunch bags. This isn't a bad thing, however, as it just forces the kids of today to be more creative with their stories on how they escaped danger on their way to and from school!